The 2007 Selvagrossa Muschén is a forward, fresh and vibrant wine that is made from 60% Sangiovese, 30% Merlot and 10% Cabernet Franc. It is fermented and aged in stainless steel and sees no oak. The wine shows Sangiovese's vibrant, acidic backbone, which gives the wine its verve and direction along with some elegant cherry tones. The Merlot adds a bit of mid-palate richness and some warm texture to the Sangiovese's brightness while thickening it toward the finish. The spicy, complex Cabernet Franc is what brings everything together. This 2007 vintage is sensational - beautifully ripe fruit grown in stellar conditions. The 2007 wines show it - they drink with a particular ease, elegance and balance. "Muschén" is a name that Alberto's grandfather gave to him. In local Pesaro dialect it means a little fly, akin to an annoying gnat, just like owner Alberto Taddei was as a young boy! 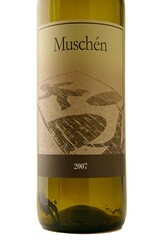 Only 600 cases of 2007 Muschén were produced.